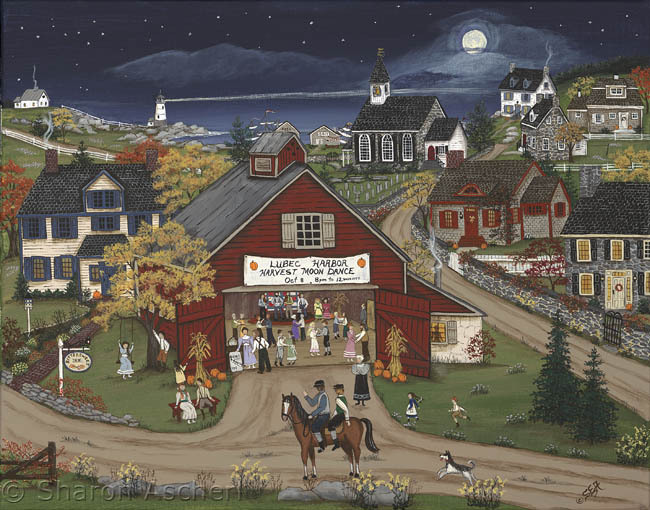 Every fall the little town of Lubec Harbor has the Harvest Moon Dance. Everyone in town looks forward to this annual event, old and young alike. The lighthouse keeper's two sons have finally finished their chores and have come down to the dance on the family horse. The two young ladies in the back of the room by the band have been waiting very excitedly for their arrival. The white haired lady standing outside of the barn is the "self-appointed" chaperone to the couples who have decided to go outside. A pesky little sister is peeking around the door at her sister and her beau. How I wish things were still this innocent!